For the second week of Advent we added pine cones to the center of our wreath to represent the plant kingdom. K had the honor of lighting the candles as we read our verse and sang our song, and she blew them out at the end of the night, too. We added trees and pine cones to our manger scene. We don't have nativity trees yet but these will do. We only have a few pieces for our nativity and plan to buy a few more every year until it is complete. That feels appropriate to me as it goes along with the patience and anticipation of the Advent season. Since this is the week of the plant kingdom we decided to get our tree. I know, traditionally, you are supposed to wait until after the fourth light of Advent, but this is the first year we are having a 'real' tree and I didn't want to make the girls wait any longer. Maybe next year we will wait until the fourth light but for now I am just going with the flow and with what feels right for our family. Sunday was also St. Nicholas day, which is always an exciting day in our house. 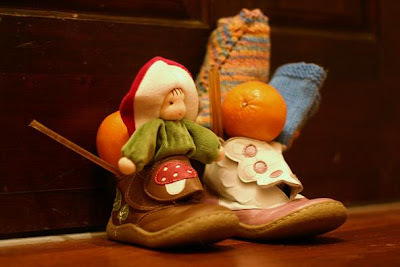 We read one of the St. Nicholas stories before bed the night before and the girls put their shoes by the front door with carrots for St. Nicholas' donkey. As you can see I had to undo the velcro a bit on each of my girl's shoes to fit the clementine, golden walnut, honey stick and small gift. Our St. Nicholas decorations were very simple this year. We had our usual St. Nicholas figure out on our night stand so the girls saw it right away upon waking, and we added a couple new items as well. If you desire to, you can see our last two St. Nicholas Day celebrations here, and here. We, once again, missed celebrating with our wonderful friend Tiffeni. On a side note: I can not believe all your kind words on my ornament. Thank you so much! I don't even know what to say!! Remember you have until St. Lucia day next weekend to enter to win! I hope everyone had a wonderful celebration (if you celebrate these holidays) and weekend. Wishing you all lots of warmth! love this post. such sweet little thoughts and gifts. good for you for going with the flow and trusting your instincts. we also got our tree(s) this week...plant week seemed appropriate :). I was trying to wait to get our tree as well but I don't think we can wait any longer! I'm too excited. I love the clementines and the honey sticks! I picked up honey sticks at our WS Holiday Faire on Saturday for this very purpose. St. Nick also left a fruit leather in each shoe as well! Love seeing your celebration for St Nicholas day. It was our first time celebrating it also, and there are things that I shall make different for sure next year. Did your girl put their shoe the night before or the same night? I love all the present you putted in your girls shoes! Did you make all of them? 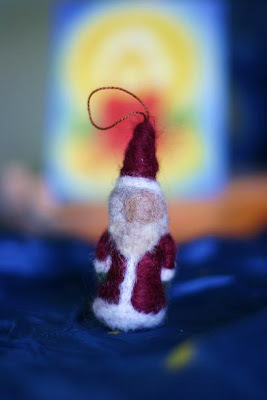 I really like the needle felted St. Nicholas. Where did you get those adorable little mushroom shoes? You might have mentioned that before somewhere on your blog, but are you German? Just asking because the Nikolaus und Ruprecht book seems to be in German. this looks like a really lovely and meaningful celebration! wow--i love the saint nicolas gifts. I am pretty new to this stuff and find it so amazing. Thanks for the post. So beautiful, you really make holidays special. I am fairly new to Waldorf and trying to establish our familys traditions and it is so inspiring to read your blog! Thank you! All of these pictures are so sweet! I really like the St. Nicholas ornaments (I imagine many needle felted ornaments to be made over the years), and I love how you use the bowl in the center of your wreath. We added pine cones also, to our nature table. We got our tree today because it is the week of plants it just feels natural to do it this week. Last week we spent time at the beach to collect rocks and shells. It is hard to find plant activities in December. Please tell me about your girls' shoes they are so beautiful. I love your pictures! 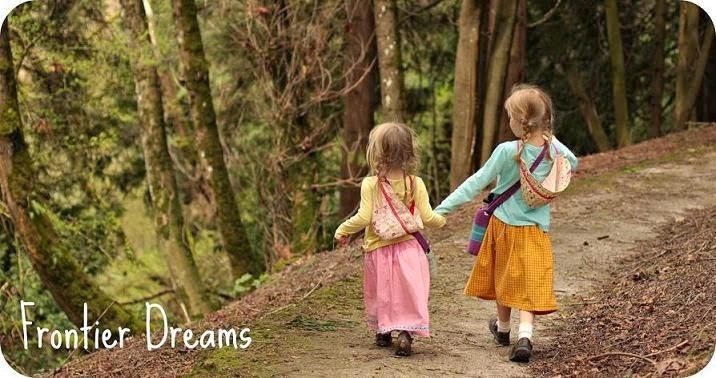 And i adore this time of year...the expectation, the inward spiral...the joy and magic that is inherent in children. I just got the email with your basket pattern too. Thanks for sharing your St. Nick day! I was lazy and let my daughter experience St. Nick with her classmates at school. Too hard to explain St. Nick coming so manyplaces! My favourite picture is that with the filled shoes- very sweet! But when I noticed the title of your book, I was surprised; do you also speak german? Or is it just your love for those watercolor pictures in there? I just shared your post with my children they were so thrilled to see your St. Nicholas celebration as we enjoyed ours so much. The close up of your girls shoes with treasures could not be any more cute! I love the idea of the golden walnut and honey stick something to remember for next year! The shoes are by Livie and Luca. HTH! Ashley S.P. - I picked up the doll at our local Waldorf school but she was made by The Moon Goat on Etsy. Petithappiness - We put the shoes out the night before so the girls could enjoy that part of the tradition. I made the clothes for K's doll but the mushroom baby was made by the moon goat. Joy - Thank you Your celebration looked wonderful, too! Naturalearthfarm - Thank you! Mel makes amazing things! Ramos family - We are not German.. well we have german ancestory but we do not speak German :) I know it seems like it with all our German things, huh? Tee hee. We have a love for Germany's wonderful craftsmen and artisians!! Kelly and Kelly - Thank you! 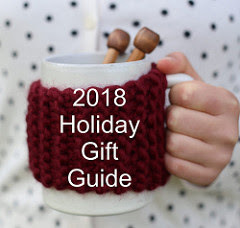 Knittermama - Thank you! Your package is on it's way, btw! *erin* - Thank you so much for your kind words. Bora- ahh yes, you got us! It's the watercolor pictures for sure! Gardenmama- Thank you! How funny, I showed K the pics you had of your celebration and she was so excited to see yours, too! 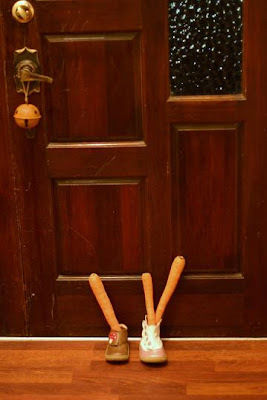 Hello;Just visiting your blog for the first time...In holland where I live ,we also celebrate the feast of Sinterklaas..
helpingfriends/servants; ZWARTE PIET and also a lot of presents and sweets. During these 2 weeks he brings at night sometimes a little present for the children who have put their shoes under the chimney/fireplace,while singing songs for him. So he rides on his white horse on the roofs and ZWARTE PIET throws the presents through the chimney.But not every night; so it's always a surprise if you will get something!! Children are listening at night if they hear trip- trap from horsefeet on their roof! Finally on 5 december (the birthday of sinterklaas)he brings a big sack with a lot of presents to the family's;mostly they are all together with grandparents and oncles and aunts too. a present wrapped in a handmade funny box(like a doll or a car or a big lipstick, or a football or whatever)And also a funny poem about that person. On 6 decmber SINTERKLAAS leaves again, back to Spain. is there an ISBN number on the book? it should either be under the barcode or on the back of the title page (with the other publishing information). i would love to try to find a copy of that book! my husband's german and we want our children to understand at least a little of the language. this looks like the perfect way to introduce them to it and to german holiday traditions! thanks for looking! i really appreciate it! Sure - the ISBN is: 3-934381-06-5 HTH! I found your site by accident last night while looking up the words for the fourth week of Advent. I forget them every year. I am a Waldorf parent and pre-school teacher in CA, and I think you've done a lovely job of bringing the season alive for your kids. My family always gets our tree on the second Sunday, as well, so don't let that bother you. You have to create traditions that work for your family. Happy Holidays!